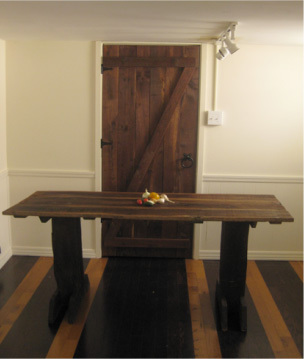 In its previous life the oak table-top and legs of this harvest table served as siding and beams of a pre-Civil War era barn in southern Ohio. In keeping with its rural roots, the reclaimed barn wood has been transformed into a harvest table, perhaps similar to one that might have been used during harvest by the same pioneers who built the barn from whence this table came. 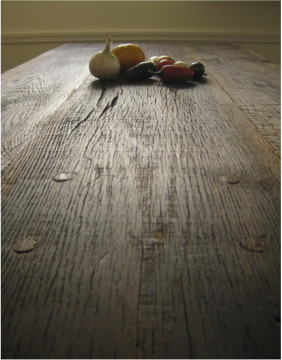 The oak table-top and hand-hewn legs show character and patina that can only be achieved with age. 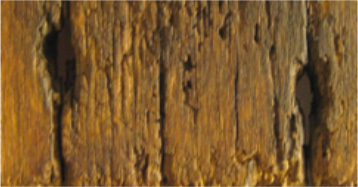 The original nail holes at each end of the table have been retained to remind us of this wood's storied history. Other reminders include the faded red paint found on the underside of the table-top, conjuring images of the idyllic red barn that the materials of this table once helped support. Custom order only. Contact us to begin the collaborative process of designing a custom piece of furniture.